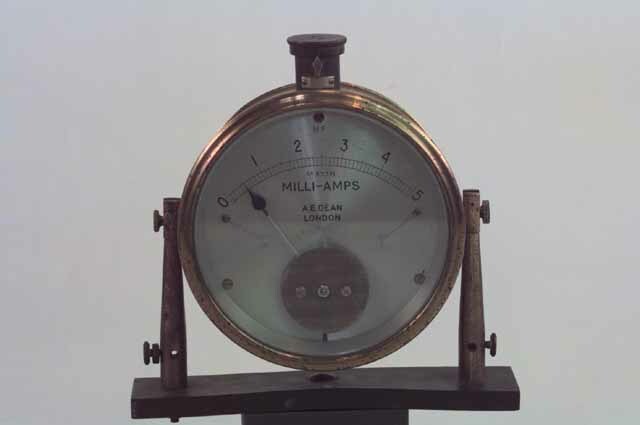 The ammeter was made by A.E.Dean of London and is estimated to be used in the early part of this century for medical purposes. The ammeter is enclosed by a 15cm diameter case of brass which is approximately 7cm in depth and has a glass face. The ammeter is connected to a terminal and stand on either side of the glass face. The terminals and stand are mostly brass as well. There is a 5cm long cylindrical non-conducting piece attached to the base of the ammeter stand, which was used to secure the ammeter to an external device. Thus it might be that the ammeter was a portable one. It has been suggested that the ammeter was used for high frequency currents, due to the H.F. that is imprinted on the face. A high frequency ammeter would have been used in the early part of this century to measure the current in the medical process, called Diathermy. Diathermy is a medical operation that uses high frequency currents to heal broken and wounded tissue in the human body. The internal structure of this ammeter is typical, the input current flows in through the terminals and is split by a parallel circuit of 3 coils of wires which can control the sensitivity of the ammeter, and a gelatine looking sandwich plate that is attached to the roof of the ammeter. The actual function of this plate is unknown but it is expected that this must be some sort of rectifier if this ammeter was to be able to use AC signals, and hence high frequency signals. This plate attached to the roof and the three coils are also in parallel with a standard galvanometer. 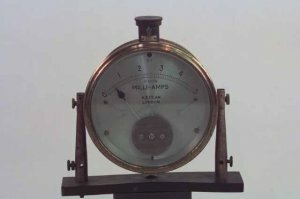 The galvanometer consists of a curved coil of wire and a needle placed near to the coil. A current flowing in the coil produces a magnetic field which can move the needle. The amount the needle moves is dependent upon the strength of the current. Conclusions about this ammeter are hard to make since there is nothing known of the origin or the donor. Ammeters of similar appearance have been noticed on x-ray equipment.